Ultra Violet Cabinet / U. V. Cabinet, usable for Viewing paper and thin layer chromatograms. For Visualization of test objectives under Tubes having long wave length (365nm), Short wave length (254nm) as desired. Use with ultraviolet Lamp for Observing fluorescent effect chromatograms etc. Supplied with 3 tubes to work on 230 volts A.C. Only. Provides an enclosed viewing space which eliminates external light interference. Control switches mounted on top of the unit. 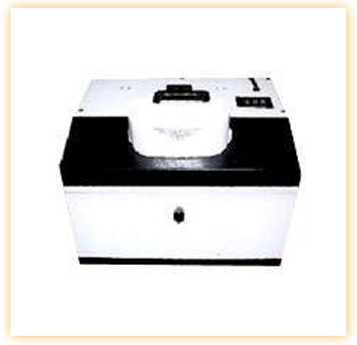 This self Contained unit is designed for easy viewing and making of chromatograms.